Dr. Navid Rahmani is a leading, best rated dental implant specialist in New York and one of few implant dentists in NY region to offer newest and most advanced dental implants options and latest procedures. Dr. Rahmani of NYC Dental Implants Center is located on Upper East Side, Manhattan. Missing teeth can create substantial problems, affecting both your dental health and your appearance. Even a single missing tooth can affect the stability of your remaining teeth, making it more likely that they will shift out of position towards the empty space. The teeth directly opposite the space will begin to over-erupt which will affect your bite and could cause more problems when you eventually replace these missing teeth. Bone loss can add to this instability and it may affect the area around your sinuses. Your sinuses are located on either side of your nose, just above the upper jaw and affect your upper back teeth. Losing teeth in this area can increase bone loss in an area where bone typically tends to be thinner than normal as the sinus cavities can begin to expand. The cosmetic effects of missing teeth can be equally dramatic, particularly as bone loss increases. Your natural teeth help to maintain the correct facial dimensions between your upper and lower jaws and they provide support for the muscles in your cheeks and lips. Tooth loss changes the overall dimensions of your face so your upper and lower jaws will become closer together, and a lack of support for your cheeks and lips will make it look as if your face is collapsing inwards. This can be prematurely ageing and may create unwanted wrinkles and folds in your skin. 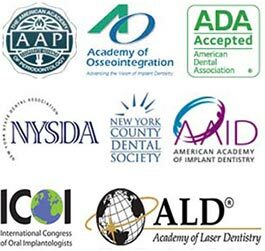 Do you have any questions about solutions for replacing a Missing Teeth or Tooth Bone Loss in NYC? Would you like to schedule an appointment with the best dental implants specialist, Dr. Rahmani of Dental Implants Center NYC, please contact our office for consultation.